One of rugby league’s greatest ever forwards Glenn Lazarus says Josh McGuire’s eye gouge of fellow Queenslander Cameron Munster on the weekend was “the most dog act” he’d ever seen. 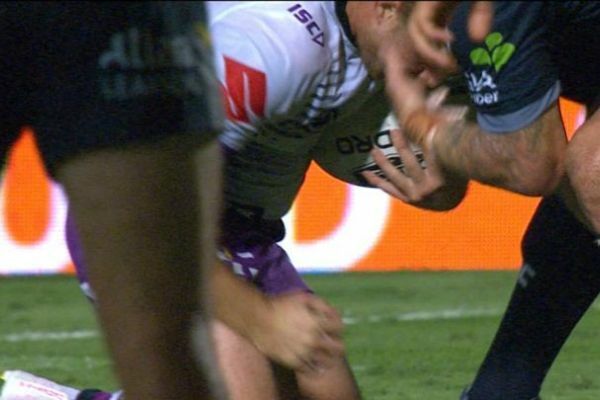 McGuire could be seen in the North Queensland versus Melbourne match pushing his finger into Munster’s eye as the Storm gun was attempting to play the football. “Not once did I ever have it cross my mind to eye gouge somebody”, Lazarus told Macquarie Sports Radio. “That is the most dog act I’ve ever seen. “He’s a repeat offender. He should’ve got at least 8-10 weeks for what he did. That was an absolute disgrace. “He thought about it and then he did it. It wasn’t an accidental poke in the eye. He deliberately went in to eye gouge Cameron Munster. McGuire was fined but not suspended for the incident.